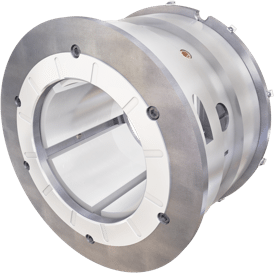 The Michell range of Journal Pad Units (JPU) covers a shaft diameter range from 40-300mm. There are 5 tilting radial pads per set which can be arranged so that load is applied directly to one pad or shared between two pads. 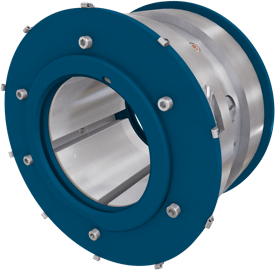 Each pad is manufactured to give a preload profile at the working face to ensure that a converging, pressure generating hydrodynamic oil wedge is always formed between the radial pads and the shaft. Bespoke designs are available for any requirements that fall outside of the standard range. Centre or offset pivoted radial pads can be used. Length to diameter ratios of 0.4, 0.7 and 1.0 are available. Can be arranged for flooded or directed lubrication (to minimise power losses). 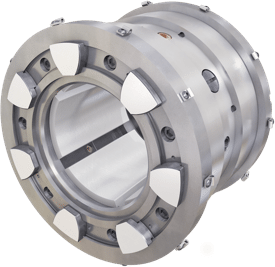 Can be supplied with end baffles, floating seals, location faces or tilting pads at the ends of the bearing. High pressure oil injection can be provided if required. Instrumentation can be included as required. +44 (0) 191 273 0291. Tel: +44 (0) 191 273 0291.